Thank you for choosing us for your eye care needs, and for visiting our website. It is our sincere hope that you are happy with your vision and eye health. If you have any further questions or concerns, please let us know right away. We are here for you every day that the Santa Rosa Costco is open. We are very grateful for all the kind comments we have received from patients, some of which are displayed here. Now, with the availability of a large variety of review and rating sites, we humbly request that if you are happy with our eye care services, please give us a positive review on one of the following websites, or any review site that you regularly use. Eyeglasses: Options for frames and lenses. Contact Lenses: Types, reasons for, and care of contact lenses. Dr. Hall: Education, honors and experience of our main eye doctor. LASIK: Dr. Hall has had LASIK, and has helped many patients with Laser Eye Surgery. Eye Care Definitions: General definitions for many eye-related terms. Prevention: Things you can do that may slow down age-related conditions. Green: How we strive to provide eco-friendly eye care services. 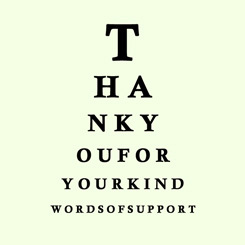 Thank you again for trusting us to provide you with your eye care, and we look forward to seeing you again! If you have any further questions or concerns, please call our office at (707) 570-2418.